Tron (TRX) by now has already become a solid competitor of Ethereum and EOS when it comes to the amount of transactions per second and the creation of decentralized apps (dapps). However, TRX has fallen back to position #11 on Coinmarketcap. Over the weekend, Cardano (ADA) took its place and re-entered the top ten list. 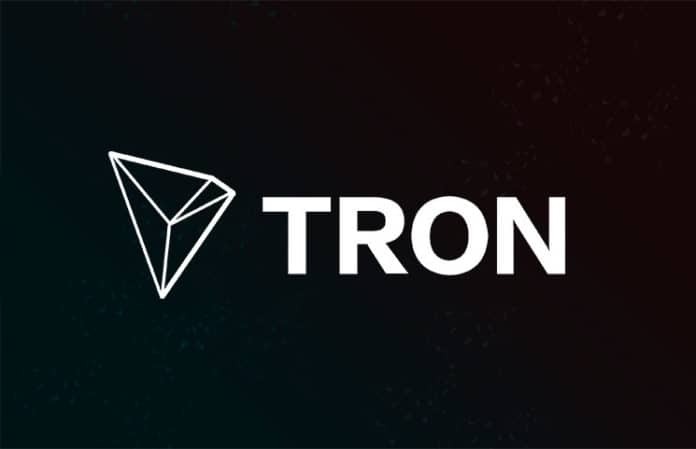 Justin Sun’s brainchild Tron keeps gaining popularity among those who create dapps and who dreams of achieving the goal Tron set itself – to turn the Internet into a fully decentralized space. Recently, Misha Lederman, the creator of Iamdecentralized.org, a dapp expert and a prominent supporter of Tron, published a tweet, saying that Justin Sun’s platform is becoming a safe haven for dapp developers. Apparently, now Tron gets two new dapps made on its blockchain every day. The Tron’s network seems to have got a great advantage compared to its rivals – by achieving a huge number of transactions per second it has started to attract dapp developing teams, often luring them away from EOS and Ethereum. 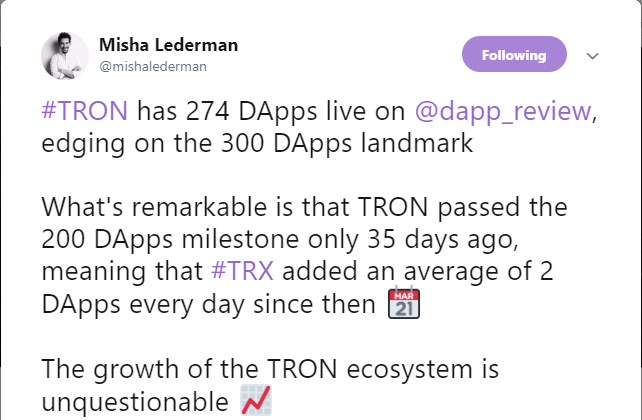 As per Misha Lederman, by now the number of dapps operating on Tron is over 280. Even with Tron’s progress in solving technical issues and Justin Sun doing his best to promote the Tron Foundation and TRX in the media, overall success is still far away, since recently Tron has been gradually pushed back from position #7. Currently, TRX is out of the top ten list of digital coins. Cardano (ADA) replaced it on spot #10 on Saturday. Justin Sun is conducting a huge marketing campaign on Facebook and Twitter. This year he has given interviews to Bloomberg and CNBC, which means the public is getting interested in both him and his blockchain. Still, that does not seem to help TRX succeed in gaining a higher market cap value. Recently, Cardano surpassed Tron on position #10 after the former launched a major upgrade. One of the goals that Justin Sun set for Tron to achieve in 2019 was to become one of the four virtual assets with the highest market cap. At the start of the year, Sun conducted a BitTorrent token sale on Binance Launchpad, thus adding popularity both to Tron itself and to TRX. Acquiring BitTorrent was a great move in the first place, many experts agree, since the giant file-sharing platform has more than 100 mln users and Sun plans to convince them to join the Tron user-base. Now, by advancing on the dapp field, Justin Sun is ensuring technical progress for the Tron Foundation. The Tron community believes that all these factors will ultimately let Tron achieve its goals.